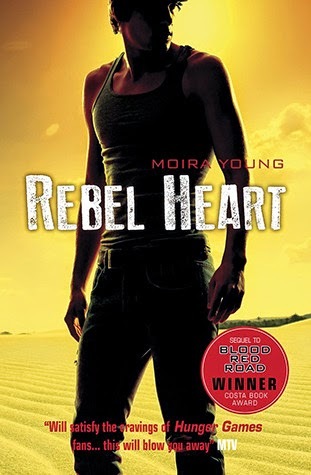 Oh man, Rebel Heart by Moira Young was good. I was worried about how I'd feel about this second book in the series especially because the first book, Blood Red Road, was one of my favourite books that I read awhile back. And when you love the first book as much as I did, it always makes me think that maybe the second book won't quite live up to my expectations. While I would have liked to see more of my favourite characters in Rebel Heart (I'm lying. I really just mean more Jack!) I still really loved where this book went. The ending of Blood Red Road had Saba thinking that everything would now be fine and her and her newly-rescued brother, Lugh, and their little sister, Emmi, and Tommo and their little band that is left after the big fight against the Tonton are all set to ride off into the sunset and into their happily ever after. But that is not to be the case. First, Jack, has gone on his own mission that he can't get out of. I understood Jack's reasons for separating from Saba and the group and while I felt like it meant that something vital was lost within this book, I also still really appreciate that he's done this. He's putting his own honour and necessities over that of his romantic relationship and I really liked that. Even if it meant that his original plan of returning to Saba is thrown out for other reasons. And with the loss of Jack in her life, Saba is really struggling. She's barely functional at the start of Rebel Heart because of the grief that she feels because of the friends she has lost. Especially Epona. Epona and all the lives that she came up against when she was fighting for survival and led Saba to be know as the Angel of Death haunt Saba. And even when she has the idea of freedom and the Big Water to look forward to, all Saba can see is what has past and how her actions have led so many to their deaths. While I did find it a little uncomfortable at the start to read of how much Saba was suffering - hearing voices, panicking, not being able to fire her bow - I found it really interesting to see Saba's journey towards being okay with herself. Another strength of this book is how wonderfully populated this story is with really amazing characters. I loved seeing Saba trying to repair her relationship with her younger sister, Emmi, and to also find some sort of peace with her twin brother, Lugh. One of my favourite characters though is definitely, Tommo. Somebody that I perhaps overlooked in the first book and to who I quickly took more notice of in Rebel Heart. I love that this book sees us going back. Back for Jack but also towards Saba's destiny. Saba has been fighting what the stars have in store for her for awhile, but in this we see her charge towards it in her own single-minded way. I love how badly she messes up, how rash and emotional she is but also how determined and capable she is throughout. She faces some grim (but exciting!) times ahead of her and I for one cannot wait! If you haven't yet started the Dustlands trilogy that I strongly urge you to do so, and immediately! Honestly, you'll be fine. It had been more than a year when I read it and as long as you know the basics (who the characters are/that they defeated some guy who was trying to take control/that some people died) I think the rest will just come back to you. I was a bit disappointed that there aren't any Recaptains posts on this series though!